THE FINAL BATCH OF THIS BOTTLE!! Sadly this wonderful glass bottle is no longer being manufactured and therefore it is not long until I can cease producing Cards in a Bottle in this particular style. I believe it to be the very best version of the CIAB as the edges of the deck touch the neck of the bottle and the pristine finish makes it truly wonderful to look at. A magical mystery object that is guaranteed to have people wondering forever more about what is possible! Each one of these bottles is carefully and painstakingly made by hand in the UK by magician Chris Harding. The glass has not been cut or altered in any way and the bottles has not been formed around the deck. 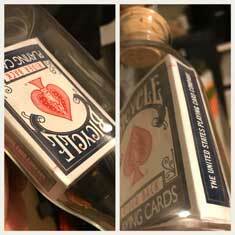 The cellophane remains intact on the deck of cards in all bottles made by Chris Harding and really adds to the mystery. A small window to show the cards inside of the box can be cut beneath the cellophane upon request. Please note that this website only accepts UK customer orders – for International purchases, please contact me with your requirements and I will issue a Paypal invoice to you once postage has been calculated based on your location. 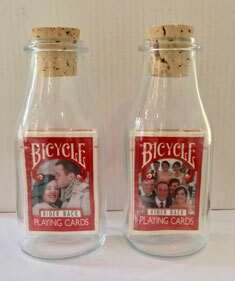 Custom decks of cards can be placed into the bottles too upon request. If you have a special deck or request please get in touch to discuss the requirements and possibilities. If you have any questions at all prior to ordering any type of Cards in a Bottle by Chris Harding then please feel free to get in touch via email, Facebook or telephone. 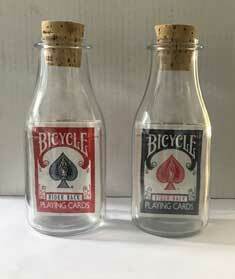 Thank you for your interest in Cards in a Bottle & Selfie Bottles by Chris Harding; please note that there is no tuition offered on the construction of the bottles nor will any methods be explained or discussed if requested. The small group of people across the world that make Impossible Bottles have individually spent years experimenting, refining and developing their own techniques to create these wonderful items and as a result, are deliberately secretive about the processes and methods used.. Sorry!